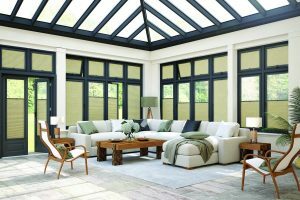 As with all things in life it seems, things change and we have to change or adapt with them but it came as bit of a shock when the Window & Conservatory industry introduced a new window frame colour, Dark Grey or Anthracite as it is now called. It looks absolutely gorgeous, just a simple matter of powder coating some Aluminium extrusion and we are ready to go, if only it was that simple. With the colder months now upon us our thoughts turn to tweaking the central heating controls to stay cosy and warm but did you know that you can lose up to 20% of that very expensive heat through your windows. Hive Pleated Cellular blinds help to significantly reduce this heat loss through your windows which by its clever design traps air within the blind thus providing insulation. We are pleased to announce the arrival of TWO new Perfect Fit frames, Anthracite, which is featured above, together with Silver. These colours are in addition to our current 4 colours of White, Brown, Golden Oak and Mahogany, all colours are available with immediate effect.